PATNA: It was not very long ago when chief minister Nitish Kumar would literally dictate which BJP leader will enter into Bihar and who ones will be engaged in polls campaign. Call it his political compulsions or the change of time, Kumar was on Thursday caught on camera rushing to the state guest house where BJP chief Amit Shah was staying, with a bouquet in hand to welcome him, rather than meeting his ally at a “neutral” point, inviting sarcasms from the opposition. The meeting had been planned in the backdrop of the continuing differences between the JD-U and the BJP over the issue of seat-sharing but it lasted for just 45 minutes during which the two leaders barely exchanged pleasantries over breakfast. 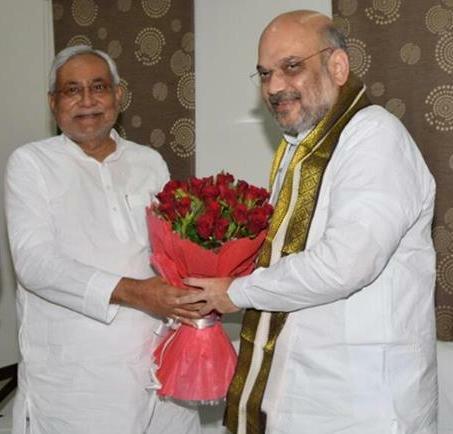 Although it was not clear if the issue of seat-sharing was discussed in the presence of crowds of BJP leaders, Shah later made it clear his party’s alliance with the JD-U was intact and would win all the 40 LS seats in Bihar. But, this still remains a mystery as to which party will contest how many seats—the issue which has caused tension in the NDA camp. “Opponents should stop drooling…we are not going to indulge in any fight with the JD-U. Together, we are going to make a clean sweep in Bihar,” Shah told a meeting of party workers in Patna, shortly after his brief meeting with Kumar who also heads the JD-U. However, he didn’t reveal as if the JD-U will be given the lion’s share of seats which it has repeatedly demanded for long. Although Shah met the chief minister over dinner again this evening but sources said the BJP wants to keep the issue of seat-sharing lingering. The reason is that any clear-cut decision over the issue could antagonize BJP’s another two allies, Lok Janshakti Party (LJP) led by Ram Vilas Paswan and Rashtriya Lok Samata Party (RLSP) headed by Upendra Kushwaha who could jump the NDA boat while the BJP faces the pressures to win maximum number of LS in Bihar to retain power at the Centre. The problem before the BJP is that the JD-U wants maximum number of seats to contest in Bihar despite winning only two seats out of Bihar’s total 40 LS seats in the last LS polls. On the other hand, the NDA comprising the BJP, LJP and RLSP had emerged victorious on 31 seats. Of them, the strike rate of LJP and RLSP was superb as they won nine out of 10 seats given under seat-sharing whereas the BJP won 22 out of 30 seats it had contested. The BJP is thus said to be finding it hard to ignore its two trusted allies at the cost of the JD-U which switched sides only last year. Observers say the way the chief minister rushed to meet the president of the BJP amply indicates how he is losing his political very fast. “Nitish Kumar today looked a dwarf before the BJP chief. He rushed to meet Shah at the state guest house (where the latter is staying) and the BJP would indeed have got sadistic pleasure to see the chief minister standing before it. This has also made it clear who will be the face of the NDA in Bihar,” commented RJD vice-president Shivanand Tiwari.